Is my 2 year old a racist? I don't consider myself to be racist. I couldn't care less what a persons skin colour is, what religion - if any - they subscribe to, what their ethnic background is, any of it. If some one is nice to me I'll be nice back. If someone chooses not to approach me I'm fine with it. If someone wants to be off with me, well to hell with them, I can live without people like that in my life. I am very much a "live and let live" kind of person. I hope I am raising my kids to be the same. OK, I don't hammer into my kids that "we are all equal", but I don't in any way suggest that one group of people is any better or worse than an other either. I think I once said that the entire human race was a blight on the planet... That is as close as I have come to any opinion on any people and my conclusion was that we are all equally shite. One of my in-laws shared this photo earlier today (Hubby's family are from Rotherham) and apparently it's going to be in the national press soon too. It seems that this couple were doing what so many of us have done countless times, they were singing the theme tune to a kids show to their child while riding the bus. Totally innocent! Except that the show happened to be Peppa Pig, and they were snorting. Like the characters do in the show. Like I do with my kids, and my kids do too. 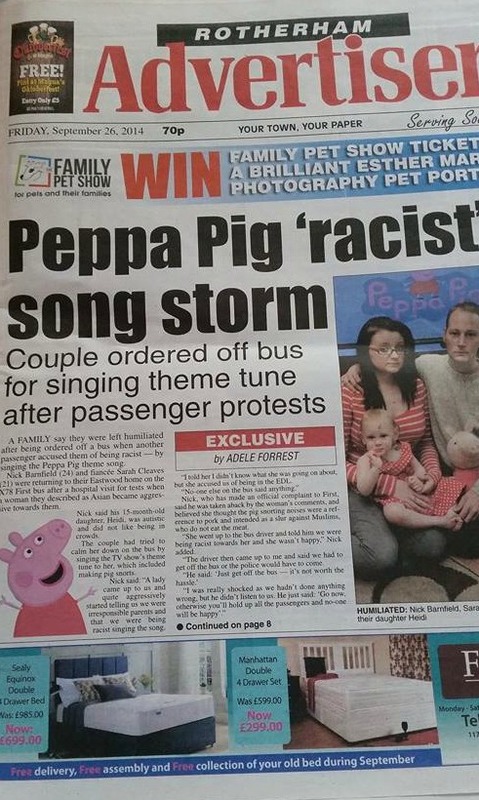 Now... the story goes (according to the press currently available such as Metro.co.uk) one lady took severe offence to the pig noises, claimed the couple were being racist, and complained to the driver. The end result being the family were asked to leave the bus. This is all being investigated and hopefully the truth about this situation will become clear. But if this is true then in my opinion it is not the couple and their child who are racist, but in fact the woman who made the complaint. She has assumed that this couple were making anti Islamic noises based on... what? Really luv, get a grip. I could understand a certain level of reaction if it was a bunch of drunken youths with recognisably racist icons tattooed on their faces snorting and oinking away, but sometimes white people making pig noises are just parents entertaining their kid on the bus. 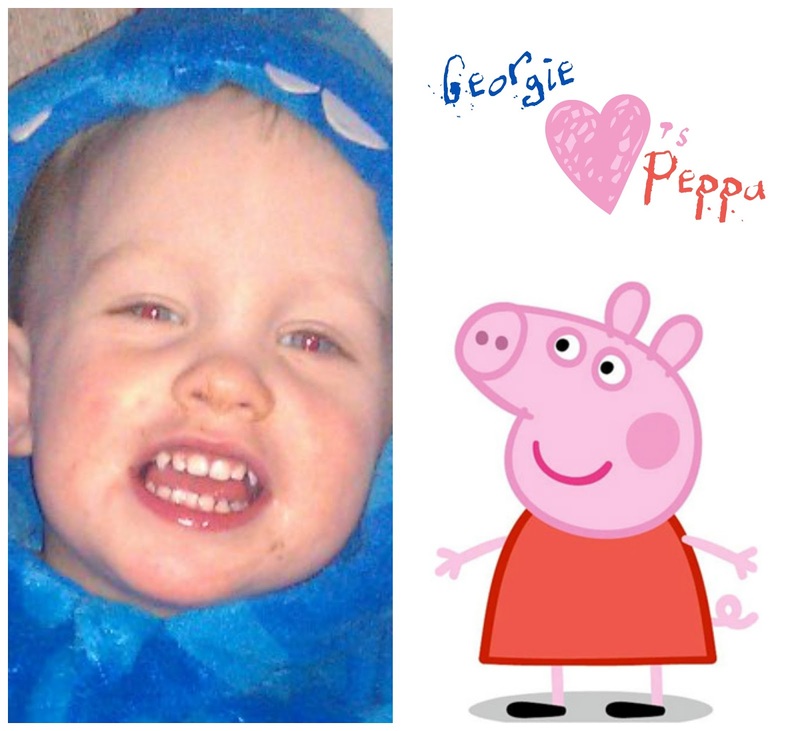 Lets hope that this is all just a bit of stupidity brought about by one paranoid woman on the bus, or else someone is going to have to break it to my poor little 2 year old Georgie that his beloved Peppa Pig toys, books, dvds and pyjamas have been banned due to being racist.